Love everything green chile? 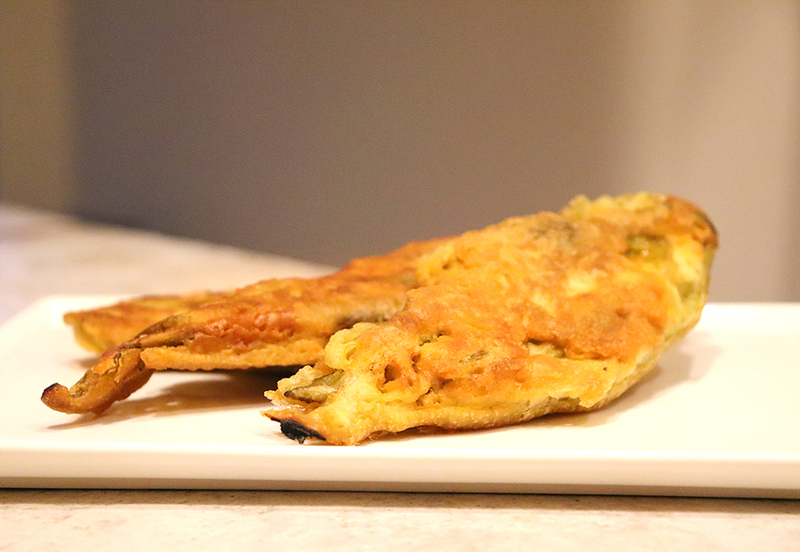 Learn how to make Fried Green Chile Strips to satisfy your chile cravings! When I lived in the Eastern part of New Mexico, there was a restaurant that served fried green chile strips. They were similar to chile rellenos, but without the stems or cheese. 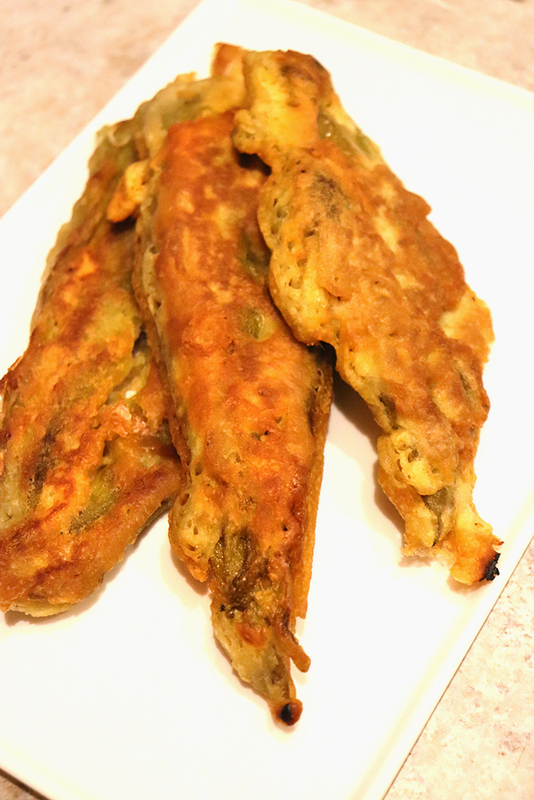 Think strips of green chile, battered in a flour and egg mixture, then fried. Served with a little bit of ranch dressing on the side. These green chile strips were warm, salty, and crunchy with a soft spicy center. It’s been several years since I have had green chile strips, so I set out to recreate the recipe at home! To make these fried green chile strips, you’ll need whole roasted green chiles. 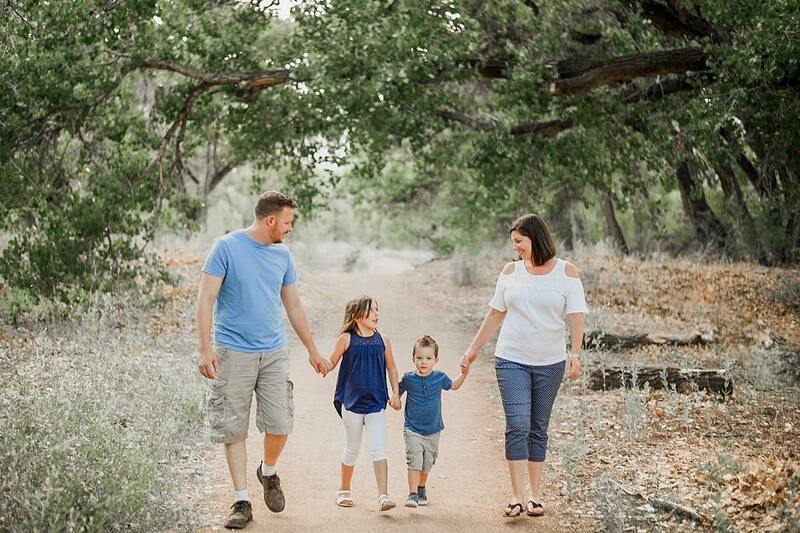 These are easily found between August – October in most parts of New Mexico. 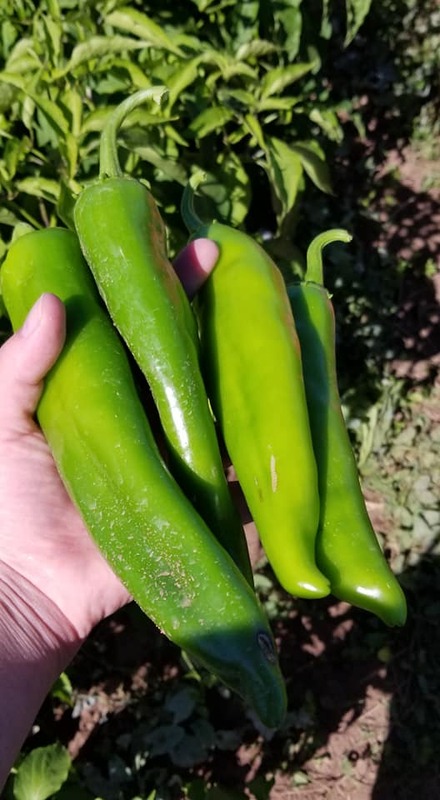 If you don’t happen to find yourself in New Mexico during August and October, but still want to make this recipe, you can snag fire roasted whole hatch green chile from Chile Monster. 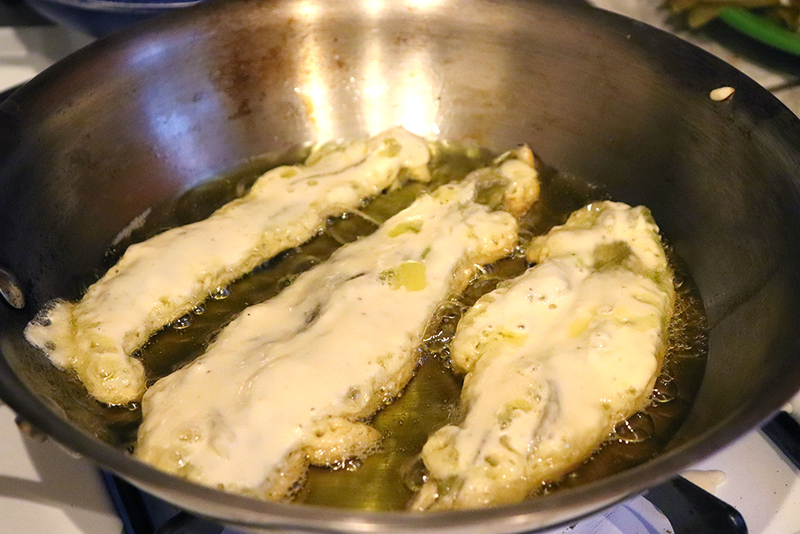 To make fried green chile strips, you’ll remove the peels, seeds, and stem from your whole green chiles. Pat chiles dry, removing any water, and set aside. In a medium bowl, you’ll combine flour, salt, and baking soda. Mix well, then add an egg and 1 cup water. Heat oil in a large pan over medium-high heat. 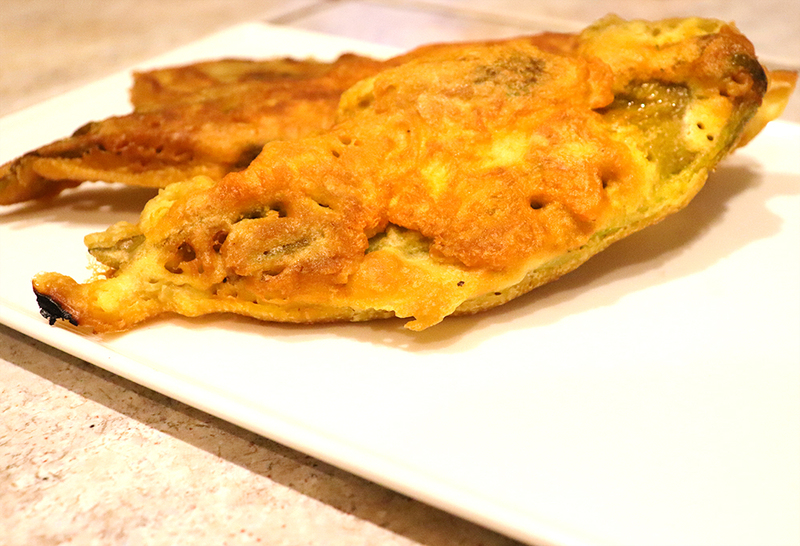 Dredge green chile into batter, then place into hot skillet. Fry on each side, 30 – 60 seconds, until crisp and brown. Repeat for remaining green chile. Serve warm as is, or dipping in ranch dressing. Want to print out this recipe to hang on the fridge, or share with a friend? Here is a printable version for you! In a medium bowl, combine flour, salt, and baking soda. Mix well, then add egg and water, stirring well to form a batter. Heat a large pan over medium-high heat with 1/2" of olive oil. Batter green chile, then place in oil, frying 30 - 60 seconds per side, until browned. Repeat for all remaining chile. Want to save this recipe for later? Click on the image below to add it to your favorite green chile Pinterest board! I hope you enjoy these fried green chile strips as much as I do! If you make them, please leave a comment below sharing your thoughts! I think these were Big Jim, but I cook with Anaheim frequently,too.